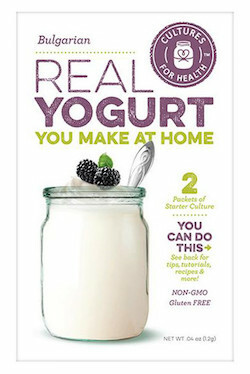 Bulgarian yogurt starter culture is the creamiest of the thermophilic heirloom yogurts. This yogurt starter can be re-cultured indefinitely with a small amount of each batch used to make the next batch. Thick, rich and mild, Bulgarian yogurt is similar to "European-style" yogurts. Each box contains 2 packets of yogurt starter. Activate 1 packet of yogurt culture using 1 quart of pasteurized milk and store 2nd packet in the refrigerator as a back-up. Shelf life: Room temperature: 3-4 months, refrigerator: 9 months unopened.